You are a curriculum for everyone you meet. Everyone you meet is a curriculum for you. This installation is a reflection on a version of these statements first posed by educational philosopher and curriculum theorist William H. Schubert, at the end of his 1986 textbook called Curriculum: Perspective, Paradigm, Possibility. This metaphor points to much more than the idea that we “teach” people and people “teach” us. This means that we each contain a complex set of knowledges and our interaction with others is a rich confluence of seen and unseen interactivity with surprises that may redirect our course in unexpected ways. You are a curriculum for everyone you meet. 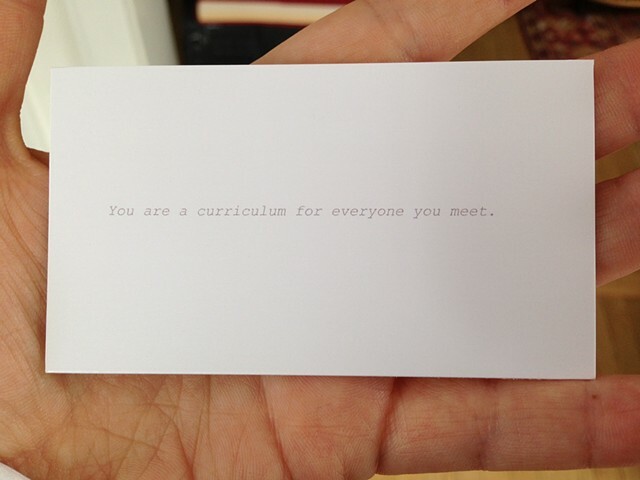 Everyone you meet is a curriculum for you.